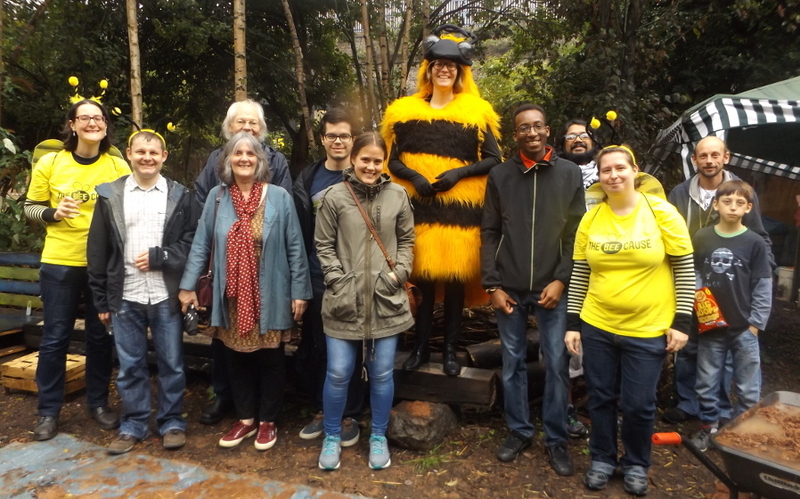 It has been a bee filled summer at Birmingham Friends of the Earth (BFoE), with the Great British Bee Count in May, the ‘Digbeth Bees Please’ campaign in June ,installing our beehives in August and hosting a thank you event for donators to our appeal in September. The British bee population is in decline and BFoE decided to do more than raising awareness about bees. We decided to take part in the conservation of bees by becoming hobby beekeepers and it developed into a campaign – ‘Digbeth Bees Please’! The campaign was a success. We reached our target of £450 to buy the hives and bees quickly and Digbeth Community Garden was approved as a good place to keep bees by beekeeper Darren Welcome (Hives and Honey). The honey bees arrived on 16 August and have settled in nicely in the garden. To thank those who participated in the campaign and those who donated towards the beehives we organised an event on 10 September. After a welcome drink (including a choice of mead!) and honey tasting, we cut the ribbon to welcome the bees, some of us even dressed as bees! Darren Welcome gave a speech and campaigners told us about BFoE’s current and past bee campaigns. After having looked at the newly built herb garden, the little pond, ducked for low hanging branches and spotted some honey bees, we made our way back to The Warehouse for a Q&A with Darren. Interesting questions and bee facts were discussed. For example, did you know that a single worker bee only makes a quarter of a teaspoon of honey in her lifetime? To complement Darren’s answers, Dim, an experienced beekeeper brought some frames and honeycomb to show everyone and all were fascinated of how good the honeybees are at engineering these perfect hexagonal honeycombs. At the end of the day our fascination for these bees had only grown bigger and it will be very exciting to follow the honeybees in the Digbeth Community Garden in the future. It was a successful event to end a BEEutiful summer.